Posted on August 3, 2014 by revivewa	in Travel and Spirituality and tagged 2, feature. For a long time now I have had a fascination with Antarctica. So much so that I did some research into working there. Not being much of a call for teachers down in Antarctica, I realised the only way I was going to get there was as a tourist. Most tourists visit Antarctica via the Antarctic Peninsula, a couple of days sail from Argentina – this was not the experience I wanted. I wanted to follow in the footsteps of the great explorers of the Heroic Age; Scott, Shackleton and Mawson. If I was going to make the journey, I wanted to go below the Antarctic Circle and really experience the remoteness of this southern world. 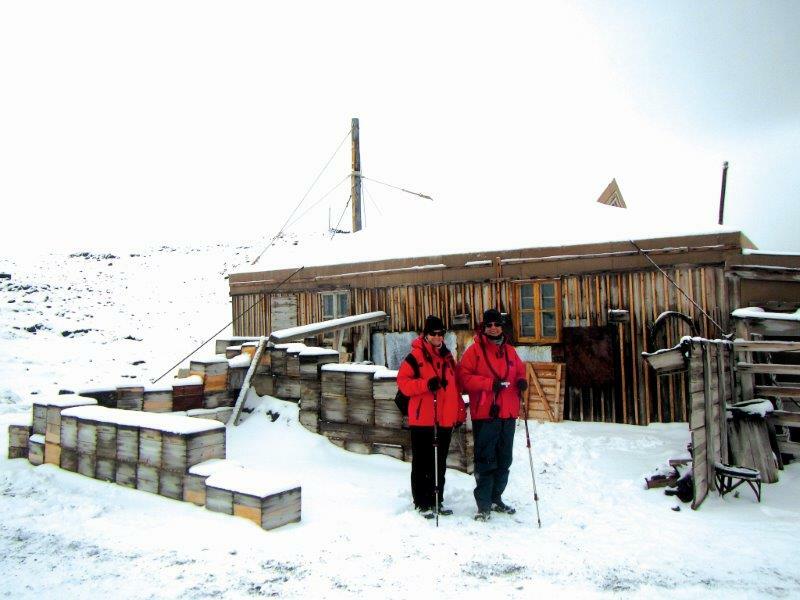 Jodi and her father, Douglas, outside Shackleton’s Hut. Yes, it is a long way away and it takes a week to get there, but the journey is all part of the experience. It makes you realise how remote Antarctica actually is and gives you some appreciation for what the explorers went through over 100 years ago. It took them months to get there and their ship was nowhere near as comfortable as ours. The further south you travel, the more you leave the hustle and bustle of everyday life behind. There is plenty of time to sit on the back deck, watching the birds glide around, being mesmerised by the waves and contemplate life. Less than 1000 people visit Antarctica each year. There are strict biodiversity controls in place in order to preserve the pristine environment. In some areas only 60 people are allowed to land at a time. Here is a rare part of our world that is relatively untouched by humans. The wildlife are not afraid and are very inquisitive; if you sit still the penguins will walk up to you. The penguins are real characters and each breed seems to have its own personality. They are such awkward creatures on the land but in the water are incredibly fast and graceful. We were able to watch seals, sea lions and whales close up as they interacted in their natural environment. One of our highlights was being able to visit Shackleton’s Hut and Scott’s Hut. These two huts are where these explorers based their expeditions from. One advantage of the cold is that it is an excellent preserver. When you walk into the huts it takes you back 100 years and you could very well be there with these heroic men – they are exactly as they left them 100 years ago. Being from Perth, snow and ice are not something I have experienced a lot of. And I found it magical. To listen to the creaks and groans of the ice as you glide through it, to stand on the bow of the ship as she tries to push her way through the thick ice, to look at the horizon and see only a sea of white ice. Sailing towards an iceberg, they start as just a dot on the horizon and then come looming larger than the ship, sometimes kilometres long. It is not just the colours but the sounds that are to be appreciated. A massive amount of fresh water has worked its way out to the coast, taking thousands of years to form, to then finally break off a glacier to be set free into the ocean. To sit in a zodiac and be dwarfed by one is an experience like no other. The enormity of its size along with the crystal clear colours it radiates and the ever-changing shape as sections are eroded by the wind and water or clave off into the sea. People say “Why? All that time at sea and there is nothing there?” There is so much there, you just have to take the time to look. You think of Antarctica as being white, and it is mostly, but when the snow melts and reveals the rock and soil underneath, you discover black volcanic rock and soil. This is quite a contrast and with no green to tempore the contrast it adds to the feeling of remoteness and desolation. People often describe how they feel close to God when they are in the natural environment. I wonder if it is the natural environment itself or the fact that you are away from the hustle and bustle of everyday life and have the time and the quiet space to reflect and ponder the world we live in.